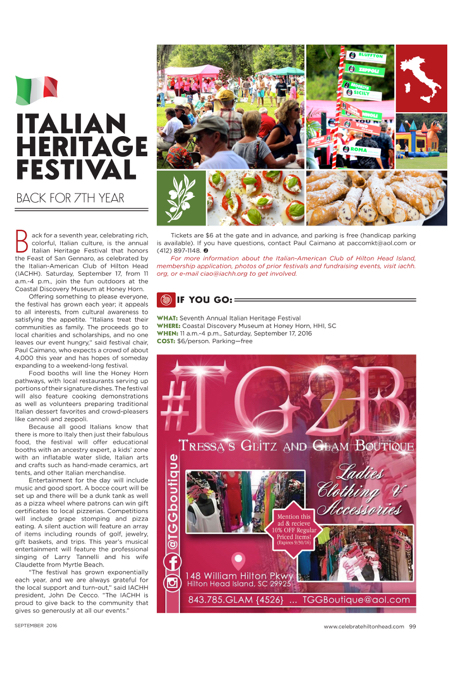 Back for a seventh year, celebrating rich, colorful, Italian culture, is the annual Italian Heritage Festival that honors the Feast of San Gennaro, as celebrated by the Italian-American Club of Hilton Head (IACHH). Saturday, September 17, from 11 a.m.-4 p.m., join the fun outdoors at the Coastal Discovery Museum at Honey Horn. Offering something to please everyone, the festival has grown each year; it appeals to all interests, from cultural awareness to satisfying the appetite. “Italians treat their communities as family. The proceeds go to local charities and scholarships, and no one leaves our event hungry,” said festival chair, Paul Caimano, who expects a crowd of about 4,000 this year and has hopes of someday expanding to a weekend-long festival. Food booths will line the Honey Horn pathways, with local restaurants serving up portions of their signature dishes. The festival will also feature cooking demonstrations as well as volunteers preparing traditional Italian dessert favorites and crowd-pleasers like cannoli and zeppoli. Because all good Italians know that there is more to Italy then just their fabulous food, the festival will offer educational booths with an ancestry expert, a kids’ zone with an inflatable water slide, Italian arts and crafts such as hand-made ceramics, art tents, and other Italian merchandise. Entertainment for the day will include music and good sport. A bocce court will be set up and there will be a dunk tank as well as a pizza wheel where patrons can win gift certificates to local pizzerias. Competitions will include grape stomping and pizza eating. A silent auction will feature an array of items including rounds of golf, jewelry, gift baskets, and trips. This year’s musical entertainment will feature the professional singing of Larry Tannelli and his wife Claudette from Myrtle Beach. For more information about the Italian-American Club of Hilton Head Island, membership application, photos of prior festivals and fundraising events, visit iachh.org, or e-mail ciao@iachh.org to get involved.